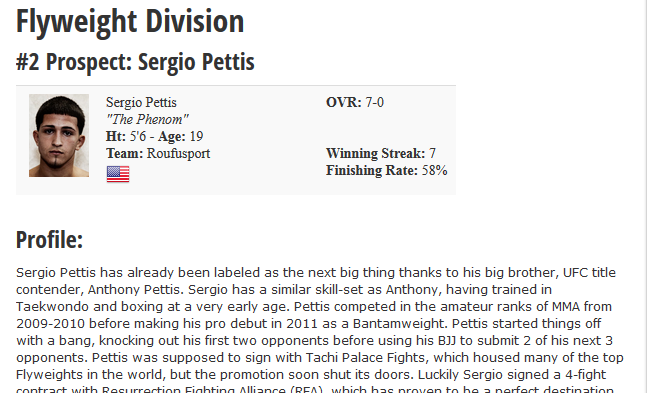 Sergio Pettis has already been labeled as the next big thing thanks to his big brother, UFC title contender, Anthony Pettis. Sergio has a similar skill-set as Anthony, having trained in Taekwondo and boxing at a very early age. Pettis competed in the amateur ranks of MMA from 2009-2010 before making his pro debut in 2011 as a Bantamweight. Pettis started things off with a bang, knocking out his first two opponents before using his BJJ to submit 2 of his next 3 opponents. Pettis was supposed to sign with Tachi Palace Fights, which housed many of the top Flyweights in the world, but the promotion soon shut its doors. Luckily Sergio signed a 4-fight contract with Resurrection Fighting Alliance (RFA), which has proven to be a perfect destination for developing prospects. Pettis’ RFA debut was at Bantamweight as he squared off against fellow rising prospect Jimmy Jones. 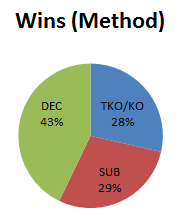 Pettis gave up a ton of size and was tested early in the fight, but Jones ultimately faded down the stretch, allowing Pettis to earn the decision victory. Afterwards, Pettis wisely decided his immediate fighting future would take place at 125 lbs. He defeated journeyman Josh Robinson and is now scheduled to face his stiffest challenge to date in UFC veteran Jeff Curran. Pettis trains out of Roufusport in Milwaukee, Wisconsin. He has been training there since he was a kid and coach Duke Roufus has obviously had time to refine and improve his already lethal striking arsenal. Pettis, like his brother, has an extremely active guard and seems unafraid to let things go to the ground. Sergio is not even close to his prime though, and he has let it be known that he’s still a couple of fights away from fighting at the UFC-level. His fight with Curran should be a tell-tale barometer for whether he is ready for the big time. Sergio Pettis has the talent and name value to become the UFC’s star attraction of the Flyweight division. We have seen Sergio’s brother, Anthony, grow into one of the sport’s most exciting strikers. Sergio is likely not far behind. The minor issues Sergio faces right now are his inexperience and age. Sergio is only 19 years old and there will likely be growing pains as he deals with high-level wrestlers and more experienced opposition. There is little doubt projecting that 5-7 years from now, Sergio could ultimately be the UFC flyweight champion or a top contender in the division.